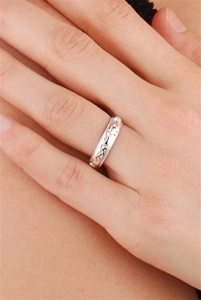 Solid Sterling Silver Ladies Celtic Knot and Claddagh Wedding Ring. Measurement: 4.8 to 4.9 mm wide. Available sizes 5 to 9 with half size increments. Legend has it that the Claddagh symbol was originated by Richard Joyce, a Galway seafarer, kidnapped by pirates and sold into slavery in North Africa where he learned the art of a goldsmith. When he was released, nothing could keep him from his beloved Galway where he returned to become a master goldsmith and where he created the Claddagh ring. Research has found no true meaning of Love, Loyalty or Eternity in the Celtic Knot. Perhaps it shows the complexity of the human spirit. The artists however make no apology in drawing inspiration and interpreting the amazing works of art to enhance their seamless wedding rings with a never ending Celtic Knot. The never ending knot work symbolizes the love and never ending commitment given in the sacred blessing of the marriage vows.